Although cooperative societies are also empowered to disburse KCC loans, farmers usually take them from either commercial or rural banks. 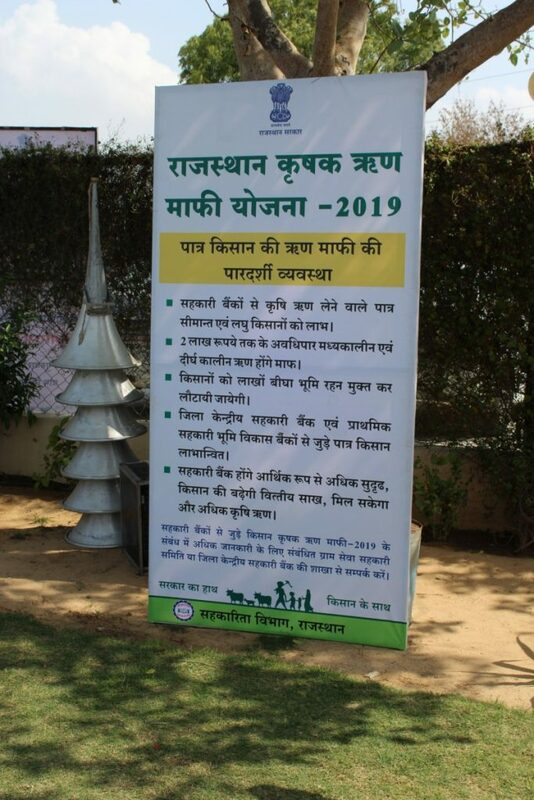 Sirsi, Jaipur: Almost two months after the Congress government in Rajasthan announced the complete waiver of farm loans, it held three-day camps, starting February 7, across the state to distribute loan waiver certificates to eligible farmers. The government decided to waive outstanding short-term crop loans till November 30, 2018 of the primary cooperative land development banks and central cooperative banks – primary agriculture cooperative societies (PACS) and large area multi-purpose cooperative societies (LAMPS). Short-term crop loans which were transformed to Medium Term Conversion (MTC), Medium Term Conversion Rephasement (MTCR) and Medium Term Conversion Rephasement and Reschedulement (MTCRR) due to natural disasters have also been included. The loan waiver is not just restricted to the defaulters. As per the scheme guidelines, if any farmer deposited a partial or full amount against his dues (that stand on November 30), he/she will still be provisioned to receive the outstanding loan amount in their savings account. The loan waiver amount is to be paid to the banks till June 30, 2019. However, the loan waiver camps would reach out to only 1% farmers associated with the cooperative societies. “There are about 6,000 cooperative societies in the state and the camps were organised for only one society per district. It will take around three to four months to reach out all the farmers,” a senior official at the Apex Bank told The Wire. Cooperative societies can disburse loans only up to Rs 1.5 lakh. The benefit of seeking loans from a cooperative society is that it doesn’t need a charge (a guarantee to secure the payment in case of default) over the land, which essentially means that a farmer who doesn’t own any land could also attain a loan. This is in contrast to a Kisan Credit Card (KCC) loan, where the farmer is given a loan on the basis of his land size. The rate of interest charged on KCC loans up to Rs 3 lakh is fixed at 7%, of which the government of India provides the interest subvention of 3% to those farmers who repay their short-term production credit within one year of disbursement. Even so, farmers face discrimination within cooperative societies. 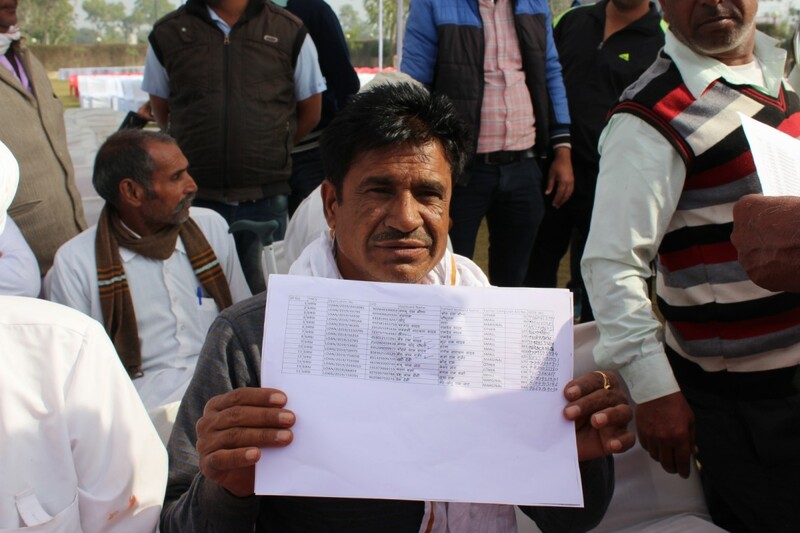 Narsi Ram from Govindpura village in Kalwar says that the loans are being allotted only to the relatives or preferred individuals of the committee members. 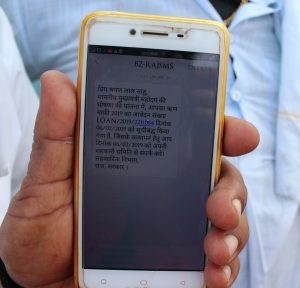 To attain the loan waiver, famers are sent a text message stating that they have been shortlisted, but that Aadhaar verification is required to proceed further. “This is the first time that a genuine debtor will get the waiver after Aadhaar verification to ensure that there is no irregularity in the process,” Neeraj K. Pawan, registrar, cooperative department said. This has raised concerns among the farmers who aren’t able to secure monthly rations as the verification machines often fail to register their biometrics. Chief minister Ashok Gehlot said that in the first phase of the loan waiver, the government will waive loans of cooperative and development banks, following which it will move to commercial and rural banks. However, a majority of the farmers The Wire spoke with at the loan waiver camps were not happy with the scheme as it did not cater to the KCC loans they had sought from commercial banks like the State Bank of India. Also read: Farmers’ Crisis: Are Loan Waivers, MSP Hikes, Assured Income the Solutions? 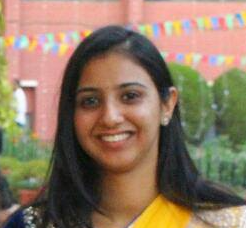 “The amount due on KCC loans is as much as Rs 10 to 20 lakh on individual farmers. If the government really wants to waive loans for the farmers, it should waive the KCC debt on them, not from the societies,” said Buddhi Prakash, a farmer from Sirsi. Others feel that the waiver is just another appeasement meant for the Congress party’s revival at the union level. “Congress jab tak roti feko tab tak peeche aayenge’ kehisabh se chal rhi hai (Congress is giving us a bit now so that we keep supporting them till the Lok Sabha polls),” Sunder Dhaka, a farmer from Sirsi who has a KCC due of approximately Rs 1 lakh, told The Wire. The Vasundhara Raje government, during its tenure, had effected a one-time loan waiver of up to Rs 50,000 for small and marginal farmers who had defaulted on short-term loans from cooperative banks.